Rigid polyurethane foam (PUR) is one of the most efficient,high performance insulation material, enabling very effective energy savings with minimal occupation of space. This report describes the properties and manufacture of rigidpolyurethane foam (PUR), one of the most effectiveinsulants. What is rigid polyurethane foam (PUR)? Rigid polyurethane foam (PUR) is a closed-cell plastic. It is used as factory-made thermal insulation material in the form of insulation boards or block foam, and in combination with various rigid facings as a constructional material or sandwich panel. Polyurethane in-situ foams are manufactured directly on the building site. In modest material thicknesses, rigid polyurethane foam (PUR) offers optimal thermal insulation coupled with an exceptional space-utility advantage. For architects and planners, rigid polyurethane foam (PUR) allows scope for creative insulation solutions from the cellar and the walls through to the ceilings and the roof. It is ideal in the lightweight, low-energy or zero-energy building approach (Passivhaus). Thanks to their excellent mechanical strength, insulation boards made of rigid polyurethane foam (PUR) are highly resistant; they can be combined with other materials and are easy to install on the building site. various support structures in halls and industrial buildings, as well as for refrigeration and cold-storage units. The lightweight panels are easy to process and can be installed in all weather conditions. PUR sandwich panels are to a high degree pre-fabricated, giving them structural and constructional design properties that offer a high level of security, both in the processing stages and in the finished building. Pronto’s Cement faced Sandwich panels have specialized rigid polyurethane foam (PUR) core with cement facings on both the upper and lower surfaces alike metal faced panels but with addition of a specialized support member. The latest innovation in this product is use of in-built structural support members. This enables construction of rooms without any support metal truss or structure. The roof panel with inbuilt-structure has a length of maximum 12 feet. Thus one span of such structure free buildings is limited to maximum 12 feet. The second span can be larger than 12 feet with multiple rooms. Wall panel have min 32mm thick wood based support member. While roof panels have much stronger tubular frame welded in H shape frame. Cement sheets are asbestos free fiber based sheet which do not expand or contract with change in weather conditions. The lightweight panels are easy to process and can be installed in all weather conditions. PUR sandwich panels are to a high degree pre-fabricated, giving them structural and constructional design properties that offer a high level of security, both in the processing stages and in the finished building. Polyurethane (PUR) block foam can be cut to shape for the insulating building equipment and industrial installations. In addition to factory made polyurethane rigid foams (PUR), in-situ foams are also used in building. They are produced with state -of-the-art equipment "in situ" on the building site itself. In-situ foams are mainly used for technical insulation applications. The in- situ foam is sprayed onto the desired surface or poured into moulds, producing a seamless structure. The properties of the insulation materials depend on their structure, the raw materials used and the manufacturing process. In the selection of a suitable thermal insulation material, the required thermal properties are of prime importance. For the functionality and safety of the building, other important criteria in the choice of insulation are mechanical strength, resistance to ageing, sound insulation properties, and resistance to moisture and fire. Rigid polyurethane foam (PUR) insulation materials display excellent insulation characteristics. They have extremely low thermal conductivity values and can achieve optimal energy savings. The excellent mechanical strength values and exceptional durability of rigid polyurethane foam (PUR) fulfil all the requirements made of insulation materials used in the building industry. The most important property of an insulation material is its insulation performance. The yardstick for such insulation performance is low thermal conductivity or high thermal resistance. Thermal conductivity (λ) is a specific material property. It represents the heat flow in watts (W) through a 1 m² surface and 1 m thick flat layer of a material when the temperature difference between the two surfaces in the direction of heat flow amounts to 1 Kelvin (K). The unit of measurement for thermal conductivity (λ) is W/(m·K). The thermal resistance (R) describes the thermal insulation effect of a constructional layer. It is obtained by dividing the thickness (d) by the design thermal conductivity value of a building component: R = d/λ (in accordance with EN ISO 6946). The unit of thermal resistance (R) is (m²·K)/W. In building components comprising several layers, the thermal resistances of the individual layers are added together. The thermal transmittance (U) is the heat flow in watts (W) through 1 m² of a building component when the temperature difference between the surfaces in the direction of heat flow is 1K. U-value can be calculated from U = 1/R for a given construction, and is generally represented in W/(m2.K). The thermal conductivity and thermal resistance of rigid polyurethane foam (PUR) insulation materials are to be determined in accordance with Annex A and Annex C of EN 13165. The exceptional insulation properties of rigid polyurethane foam (PUR) are achieved through the use of blowing agents. The thermal conductivity of the blowing agent at a reference temperature of 10° C is considerably lower than that of air [(λ air = 0.024 W/(m·K)]. The most commonly used blowing agent is the hydrocarbon pentane, either a pure isomer or as mixes of the isomers normal, iso or cyclo pentane, with a thermal conductivity between 0.012 and 0.013 W/(m·K). For special purposes, fluorohydrocarbons such as HFC-365 mfc or HFC-245 fa are employed. Owing to the high closed-cell content of rigid polyurethane foam (PUR) (proportion of closed cells > 90 %), the blowing agents remain in the insulation material over the long term. Gas diffusion-tight facings reduce the cell-gas exchange with the surrounding air. The thermal conductivity levels specified by the manufacturer are long-term values. These are based on an insulation material lifetime of at least 25 years, in practice the lifetime is expected to be greater than 60 years. The thermal conductivity levels allow for possible ageing effects. Annex C of the product standard EN 13165 describes the procedures for determining the effects of ageing on rigid polyurethane foam (PUR). The initial values of thermal conductivity are determined within the framework of third-party monitoring in accordance with EN 13165 one to eight days after the manufacture of the insulation boards by a test institute approved by the building authorities. The amount of structural material increases as the density rises. This increases the share of heat conducted over the structural material. The increase in thermal conductivity, however, does not increase in proportion to the increase in density; the thermal conductivity of rigid polyurethane foam (PUR) changes little in the density range 30 to 100 kg/m³ relevant for building. The thermal conductivity of insulation materials decreases as the temperature falls. Temperature increases on the other hand result in a minimal increase in thermal conductivity. Thermal conductivity measurements are made under standardised conditions. That is why the measured values are converted to a mean temperature of 10°C. The minimal deviations in thermal conductivity for the building applications compared with the reference temperature of 10 °C are taken into account in the design value of thermal conductivity. The declared value of thermal conductivity (λD) is derived from measured values determined under the conditions and rules set out in EN 13165. The declared value is determined from the initial measured values, taking account of the statistical scatter, and the ageing increment. It is reported in steps of 0.001 W/(m·K). The ForschungsinstitutfürWärmeschutz e. V. Munich conducted long-term tests on rigid polyurethane foam (PUR) insulation boards over a period of 15 years. The thermal conductivity and cell gas composition were determined periodically. Picture 3 shows the change in thermal conductivity of rigid polyurethane foam (PUR) boards blown with pentane over a storage period of 15 years at room temperature. In addition to the thermal conductivity of the solid material structure and the heat radiation in the foam cells, the thermal conductivity of rigid polyurethane foam (PUR) depends for the most part on heat transfer through the cell gas. The relatively sharp increase in thermal conductivity at the beginning of the study is due to the gas exchange between CO2 (thermal conductivity c. 0.016 W/(m·K)) and air (thermal conductivity c. 0.024 W/(m·K). After approximately 3 years, the cell gas composition reaches a stable equilibrium, and the thermal conductivity changes only minimally thereafter. 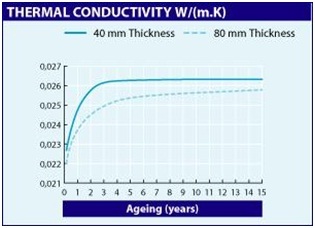 In general, insulation materials of greater thicknesses achieve lower long-term thermal conductivity values. The density of rigid polyurethane foam (PUR) used for thermal insulation in buildings normally ranges between 30 kg/m³ and 45 kg/m³. However, it can reach 100 kg/m³ for some applications. For special applications that are subject to extreme mechanical loads, the density of the rigid polyurethane foam (PUR) can be increased to 700 kg/m³. Only a small portion of the rigid polyurethane foam volume consists of solid material. At a density of 30 kg/m³ usual in building applications, the solid plastic material makes up only 3% of the volume. This material forms a grid of cell struts and cell walls that can withstand mechanical loads due to its rigidity and anti-buckling properties. 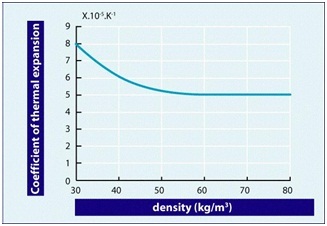 The strength behaviour of rigid polyurethane foam (PUR) is primarily a function of its density. When looking at material behaviour under pressure loading we differentiate between compressive stress and compressive strength. 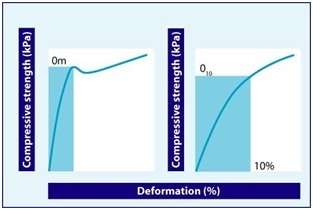 Compressive stress is generally determined at 10% deformation. Compressive strength is defined as the maximum stress up to the breaking strength. The compressive strength or compressive stress at 10% defo­­­­­­rmation of rigid polyurethane foam (PUR) insulation materials are measured in accordance with EN 826 within a timeframe of only few minutes. This is known as short-term behaviour. These measured values can be employed to compare various insulation materials. For reliable statistical measurements, it is necessary to have values for the long-term continuous compressive stress (compressive creep). For many rigid polyurethane foam (PUR) applications, a compressive strength σm or compressive stress σ10 value of 100 kPa is sufficient. In some insulation applications, for example in flat roofing, flooring, ceilings or perimeter insulation, higher pressure loadings can occur. Building structures are generally subject to static loads over long periods. The loads must be transferred safely without impairing the overall construction. With its excellent compressive stress values combined with elasticity, rigid polyurethane foam (PUR) has proved itself an exceptional thermal insulation material in such pressure-loaded applications over many decades. In certain applications – mostly in flooring – rigid polyurethane foam (PUR) is exposed to continuous static loads, for example by machines or stored materials. Here, the deformation under continuous stress is the essential factor in the static calculation. To ensure safe dimensioning in such constructions, the maximum deformation of the insulation material must not significantly exceed 2% over a load period of 20 and 50 years respectively. Long-term tests on rigid polyurethane foam (PUR) have confirmed reliable compliance with these values. 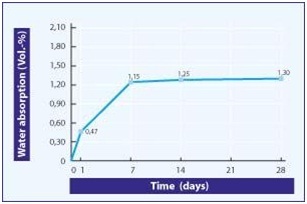 The long-term behaviour of rigid polyurethane foam (PUR) insulation materials under continuous compressive stress (compressive creep) is determined in accordance with EN 1606. Long-term pressure tests in accordance with EN 1606 on rigid polyurethane foam (PUR) with aluminium facings and a density of 33 kg/m³ have shown that this thermal insulation material produces excellent results in pressure-loaded applications over periods of several decades. Subject to a continuous load of 40 kPa over a two -year period, deformation measurements of 1.4% were obtained. In the five-year continuous load test, deformation was measured at 1.5%. Using the Findley extrapolation procedure, deformation values of 1.7% and 1.9% were obtained for periods of continuous compressive stress of 20 years and 50 years respectively. Insulation materials made from rigid polyurethane foam (PUR) are often used in combination with other building materials (for example in external thermal insulation composite systems (ETICS)) for large industrial and agricultural buildings. In such applications, they are exposed to tensile, shear and bending stresses. Thanks to their stability and exceptional insulation properties, composite elements with a rigid polyurethane foam (PUR) core have a proven performance record going back decades – even in the case of extremely thin elements too. If rigid polyurethane foam (PUR) is used for thermal insulation in flat roofs, interior finishing or in the external thermal insulation composite system (ETICS), it is important to ensure that the composite structure remains intact with no breaks in the insulation layer. Tensile stress and shear strength are important in this respect. Tensile stress perpendicular to the faces is determined in accordance with EN 1607. Depending on the density, the values for PUR lie between 40 und 900 kPa. Depending on density, rigid polyurethane foam (PUR) insulation materials exhibit shear strengths in accordance with EN 12090 of between 120 and 450 kPa. The bending strength determined in accordance with EN 12089 describes the behaviour under bending stress in certain application areas, such as plaster supports in wooden structures or bridging large open spans between the top chords in roofing constructions. The bending strength of composite elements with a rigid polyurethane foam (PUR) core depends on the foam density and the facings used; the values lie between 250 and 1300 kPa. The functional efficiency of building components in terms of resistance to moisture is largely dependent on the behaviour of the insulation materials vis-à-vis building and ground moisture, as well as to precipitation during transport, storage and assembly. Condensation moisture on the surface of the building component and condensation in the cross-section of building components due to vapour diffusion also play a role. Insulation materials made of rigid polyurethane foam (PUR) do not absorb moisture from the air. Due to their closed cell structure, they do not absorb or transport water, i.e. there is no capillary action. For this reason, normal moisture in buildings does not lead to an increase in thermal conductivity. 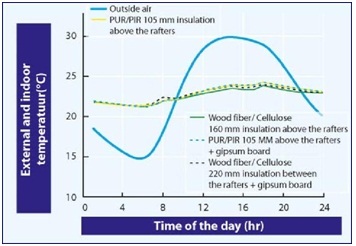 Water vapour diffusion cannot cause increased moisture levels in rigid polyurethane foam (PUR) insulation boards unless these have not been properly installed from a structural point of view, for example where vapour barriers are lacking, or due to air pockets or faulty seals in flat roofs. In laboratory tests, in which rigid polyurethane foam (PUR) insulation boards are permanently surrounded by water, absorption of water can result through diffusion and condensation. In the 28- day immersion test in accordance with EN 12087, the absorption level measured in a 60 mm thick PUR insulation board (with mineral fleece facing, density 35 kg/m³) is typically around 1.3 percent by volume. When rigid polyurethane foam (PUR) insulation boards are used as perimeter insulation, they may be constantly exposed to wetting. When rigid polyurethane foam (PUR) is used as perimeter insulation, the insulation boards are constantly in direct contact with the ground, and there is therefore increased exposure to the effects of moisture and frost. 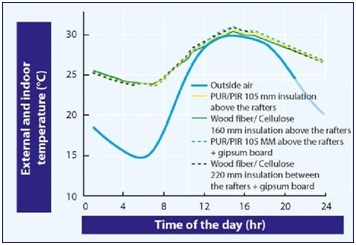 The maximum moisture absorption of rigid polyurethane foam (PUR) insulation boards due to diffusion and condensation measured in accordance with EN 12088 amounts to about 6 percent by volume. Tests carried out at the ForschungsinstitutfürWärmeschutze.V. Munich into the moisture behaviour of rigid polyurethane foam (PUR) exposed to alternating frost-thaw conditions yielded values of between 2 percent by volume and 7 percent by volume - on insulation boards without facings. The water vapour diffusion resistance factor (µ) is a prime parameter in determining the moisture -related behaviour of building components. The µ-value specifies by how much the water vapour diffusion resistance of a building component layer is greater than the same thickness of air (µair =1). 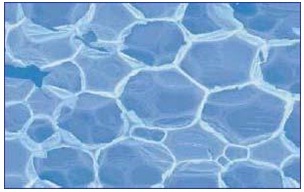 The water vapour diffusion resistance factor of rigid polyurethane foam (PUR) is determined in accordance with EN 12086. It is dependent on the density and method of manufacture. If the materials have coatings or facings, the declared level for water vapour diffusion resistance (symbol Z) must be specified. For moisture-related calculations of building components in specific applications, the less favourable value is to be assumed. The diffusion-equivalent thickness of the air layer (sd) is the product of the layer thickness(es) in metres and the diffusion resistance factor (µ). Depending on their application in the construction, 120 mm thick rigid polyurethane foam (PUR) insulation boards with mineral fleece facings have an sd value of between 40 x 0.12 = 4.8 m and 200 x 0.12 = 24 m.
All materials expand under the effects of heat. The coefficient of thermal expansion expresses the material-specific thermal expansion per 1 Kelvin increase in temperature. In closed-cell foamed plastics, the gas pressure in the cell structure also influences expansion. Measurements taken on rigid polyurethane foam (PUR) insulation boards with flexible facings and densities of between 30 and 35 kg/m³ yielded coefficients of thermal expansion of between 3 and 7 x 10-5·K-1. For rigid polyurethane foam (PUR) insulation boards without facings and with densities of between 30 and 60 kg/m³ the linear coefficient of thermal expansion lies between 5 and 8 x 10 -5·K-1. The coefficient of thermal expansion of insulation boards of higher density without facings is around 5 x 10-5·K-1. These values apply to boards or cut sections/mouldings that are not attached to a substrate or are not tautly mounted. The specific heat capacity cp states how much heat energy is required to increase the temperature of 1 kg mass of a material by 1 K. Specific heat capacity cp is measured in J/(kg·K). More heat energy is required to raise the temperature by 1 K of a material with a greater heat capacity. And inversely, less energy is required to produce a 1 K increase in temperature in materials with lower heat capacities. In accordance with EN 12524, these calculated values are to be used in special calculations of heat conduction in building components with unsteady boundary conditions. The heat storage capacity of building components is influenced by the specific heat capacity of the individual building materials they contain. The heat storage capacity C in J/(m²·K) specifies how much heat a homogeneous building material with a surface area of 1 m² and thickness (s) can store when the temperature rises by 1 K.
Table 2 shows that the heat storage capacity of wood- fibre boards is many times that of rigid polyurethane foam (PUR) insulation boards. In indoor climatic conditions in summer, these differences are negligible. With no sun protection, the interior temperature reached 31° C in the afternoon. The temperatures measured in the room show that the heat storage capacity of the various insulation materials is of no relevance. The indoor temperatures differed at most by 0.6 K.
When the window in the roof is protected from the sun, the interior temperature in the afternoon is clearly lower than the temperature outside; the room temperature remains below 25° C at all times. Here too, the type of insulation material has no significant influence on the indoor temperature. the heat storage capacity of the various insulation materials has very little effect on the indoor climate in summer. Good thermal insulation improves indoor climatic conditions in summer too. Thickness for thickness, insulation materials with lower thermal conductivities reduce the heat inflow through the external building components. 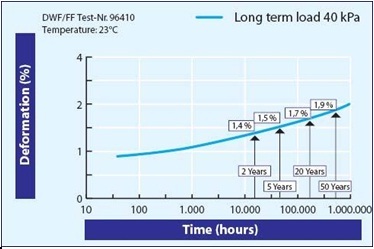 In addition to the stability characteristics of insulation materials under increased temperatures, the maximum and minimum temperature limits are also important for certain fields of application. 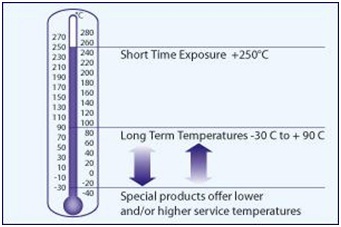 The duration of a specific temperature influence is especially important here. The temperature limit for the application of the material can become apparent through various effects, for example changes in dimensions, loss of form and stability, through to thermal decomposition. Insulation materials made of rigid polyurethane foam (PUR) have a high level of thermal resistance and good dimensional stability properties. Depending on the density and facings, rigid polyurethane foam (PUR) insulation materials for building applications can be used long -term over a temperature range of – 30°C to +90°C. Rigid polyurethane foam (PUR) insulation materials can withstand temperatures of up to 250°C for short periods with no adverse effects. Rigid polyurethane foam (PUR) with mineral fleece facings or without coatings is resistant to hot bitumen and can be used in flat roofing sealed with bituminous roof covering. Rigid polyurethane foam (PUR) is a thermosetting plastic and does not melt under the effects of fire. Furthermore, a number of special polyurethane products can be installed as insulation under poured-asphalt floor screed and withstand temperatures of +200°C without additional heat protection, or can be used for cold-temperature applications down to –180°C. Contact with chemicals can affect the properties of insulation materials. However, insulation boards made of rigid polyurethane foam (PUR) are for the most part resistant to the common chemical substances used in building. This includes for instance most solvents as used in adhesives, bituminous materials, wood protection products or sealing compounds. In addition, the insulation material is not susceptible to the effects of plasticizers used in sealing films, or to fuels, mineral oils, diluted acids and alkalis, exhaust gases or aggressive industrial atmospheres. Rigid polyurethane foam (PUR) does not rot; it resists mould and decay and is odour-neutral. UV radiation causes discolouring in rigid polyurethane foam (PUR) insulation boards without facings or at the cut faces, and over time leads to a low- level sanding effect on the surface. However, this is not a technical drawback. The surface sanding can be removed in subsequent work steps. The European test standards describe the test equipment and test arrangement, and how the test is to be conducted and evaluated. The central test method for products in classes A2 to D, excluding floorings, is the Single Burning Item (SBI) test in accordance with EN 13823. The SBI test is carried out with a gas burner whose fire load corresponds to that of a burning wastepaper basket. The following parameters are determined: fire growth rate, total heat release, lateral flame spread on the surface, smoke development and burning droplets. The SBI test replaces previously used national tests. An additional small burner test conducted in accordance with EN ISO 11925-2 is required for classes B, C and D (duration of flaming: 30 seconds). Euroclass E is tested exclusively in accordance with EN ISO 11925-2 (duration of flaming: 15 seconds). Classification standards are available to facilitate the assessment or evaluation of the test results. Construction products are assigned to ‘Euroclasses’ in accordance with EN 13501 -1 “Fire classification of construction products and building elements – Part 1: Classification using test data from reaction to fire tests”. Currently 4 different fire classifications have been decided: for construction products excluding floorings, for floorings, for pipe insulation and for cables. Under the harmonised European standards, construction products are divided into 7 Euroclasses: A1, A2, B, C, D, E and F.
The European classification system also takes account of other, secondary reaction to fire related behaviour characteristics, such as smoke development and burning droplets/particles. For building materials, three classes have been established for smoke development (s1 to s3) and for burning droplets/particles (d0 to d2). These must always be declared together with the reaction to fire classes for the classes A2 to D. For products classified class E, burning droplets have to be declared if ignition of the filter paper occurs in the small flame test, leading to E, d2. Rigid polyurethane foam (PUR) is a thermosetting plastic and does not melt or produce burning droplets under the effects of fire. Building elements are classified in accordance with EN 13501 “Fire classification of construction products and building elements - Part 2: Classification using data from fire resistance tests, excluding ventilation services”. The building supervisory authorities in the individual EU Member States are currently reviewing their national requirements in order to determine which European classes will be necessary in the future in terms of the resistance to fire of building elements. This is relatively easy in the case of the fire resistance tests and the resulting resistance to fire classes for building materials, as the national tests deviate only minimally from the new European test standards. According to the formulation and type of facings, the most common PUR boards will have a classification from C, s2, d0 till F.
For PUR pipe insulation, depending on the formulation and type of facing, a classification from BL, s1, d0 till F would be possible. Metal faced sandwich panels based on PUR can reach B, s2, d0. Since the UN Earth Summit in Rio de Janeiro in 1992, the term “sustainability” has been on everyone’s lips. But to explain sustainability simply in terms of “ecology” is not enough. Implementing the sustainability principle means taking into account environmental, economic and social aspects to an equal extent. The emphasis must be on a holistic approach that takes equal account of environmental protection, social needs and sustainable business practices. Energy conservation will be a prime demand and with the world’s population already exceeding 6 billion the preservation of food will be equally important. In this report we focused on the PUR contribution to the environmental aspects of Sustainable Development. Buildings account for more than 40% of total energy consumption in the EU. Our sources of energy, however, are not infinite. Increases in energy efficiency, i.e. energy savings and the optimal use of energy, are the prerequisite for closing the gap between finite resources and increasing demand. There is a close link between greenhouse gas emissions and energy consumption. Fossil fuels provide energy for heating and cooling buildings, for transport and industrial processes. The rise in the earth’s mean surface temperature can be attributed to the rapid increase in the burning of fossil fuels. Carbon dioxide (CO2) accounts for more than 80% of all greenhouse gas emissions. These emissions exacerbate the greenhouse effect and so contribute to the earth’s warming. In the Kyoto Protocol to the UN Framework Convention on Climate Change, the EU Member States made a commitment to reduce their overall greenhouse gas emissions by 8% between 2008 and 2012, based on the figures for 1990. These goals could be achieved through improved energy efficiency in buildings. With a doubling of the world population in 50 years and an expected 8 billion inhabitants by the year 2030, the world has an ever increasing number of inhabitants to shelter and especially to feed. The insulation efficiency of rigid polyurethane foam (PUR) is a key property for the low temperature preservation of food during processing, storage and distribution to the consumer and can save as much as fifty percent of valuable food that would otherwise rot before it is consumed. Hygiene is an important consideration where food is processed. Rigid polyurethane foam (PUR) core sandwich panels constructions eliminate cold bridges which ensure that both surface and interstitial condensation will not occur, as this could lead to the formation of bacteria and mould growth. They are supplied with easy to clean foodsafe liners especially designed to comply with the regulations. In refrigerated transport, the thickness of the insulation is constrained by the maximum width of truck and a minimum internal dimension dictated by the size of standardized pallets. Studies have demonstrated the key role of rigid polyurethane foam (PUR) core panels on CO2 saving. Hygiene is equally important for other processes that require a clean environment, such as electronic and pharmaceutical industries. These are no negligible areas of activities when we see the trend to higher technology industries and the increasing life expectancy depending on proper and adapted medication. In addition to good structural properties, environmental criteria are playing an increasingly important role in the selection of insulation materials. In terms of the ecological balance, it is important to draw on comprehensive data to evaluate the whole lifetime of thermal insulation products. This includes data on energy, raw materials and processing inputs, and on the impact of emissions and waste on the air, water and soil. In the evaluation, long periods of use and material lifetimes are crucial factors, as these decisively improve the overall ecological balance. Thermal insulation products made of rigid polyurethane foam (PUR) are extremely stable and durable; they generally last for the useful lifetime of the building. After dismantling/demolishing the building, rigid polyurethane foam (PUR) insulation materials can be re-used. Clean and undamaged rigid polyurethane foam (PUR) insulation boards can be used again to insulate top floors/attic spaces. Clean rigid polyurethane foam (PUR) waste can be crushed and made into pressed boards made of recycled polyurethane, similar to chipboard. These are used in special purpose applications, for example floor constructions, requiring additional moisture resistance. Particles from grinded rigid polyurethane foam (PUR) thermal insulation can also be used as oil binders or in combination with cement as insulating mortar. If the composition of the waste material is known and there are no impurities, one raw material component can be recovered via glycolysis. Rigid polyurethane foam (PUR) waste with impurities, or with the remains of other building materials still attached, can be burned together with other household waste in incineration plants with heat recovery systems without any additional negative environmental impacts. In the process, the energy in the insulation material is transformed into primary energy. 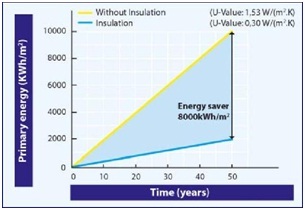 With rigid polyurethane foam (PUR) there is a dual saving: when retrofitting rigid polyurethane foam (PUR) insulation, you save up to 30% on the heating costs over a period of at least 50 years. After its useful life as an insulant, rigid polyurethane foam (PUR) can generate further savings by being fed into waste incineration plants with heat recovery systems and thus reducing the need for burning new energy sources (oil or gas). This is beneficial for the environment, for people, and for plants and animals.